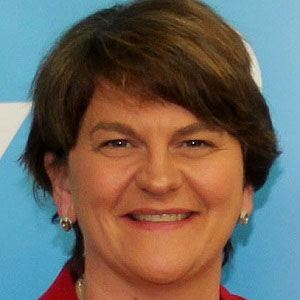 In 2003, this Ulster Unionist Party-turned-Democratic Unionist Party politician became a Member of the Northern Ireland Legislative Assembly and was subsequently appointed both Minister of the Environment and Minister for Enterprise, Trade and Investment. After earning her Bachelor of Laws degree from Queen's University, Belfast, she became active in the youth wing of the Ulster Unionist Party. She received a 2008 Women in Public Life Award. When politician Peter Robinson temporarily stepped down from his position as First Minister of Northern Ireland, she took over his duties for a one-month period in early 2010. Born and raised in County Fermanagh, Northern Ireland, she grew up during a politically turbulent time known as The Troubles. Her marriage to Brian Foster produced children named Sarah, George, and Ben. In 2008, she succeeded Nigel Dodds as Northern Irish Minister for Enterprise, Trade and Investment.